Good Afternoon, the Princess Anne Police Department sponsored an Easter Egg Hunt at Princess Anne Elementary on Tuesday, April 16th. Several students & Mrs. Monar are pictured with members of PAPD. Members of the Maryland State Police were present as well. 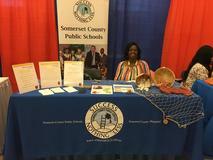 Ms. Germaine Richardson attending the Morgan State University Teacher Recruitment Fair. Maryland Teacher of the Year Dr. Richard Warren recently spoke to new teacher prospects at the Board Office on April 1. Deal Island Elementary School Principal Ted Gibson and 4th grade teacher Christa South are highly skilled in instructional technology. They will both be presenting at the annual Common Ground Conference in Ocean City on May 2, 3. Ms. South is the 2019 Somerset County Teacher of the Year. The conference is considered the top event of its kind in Maryland. 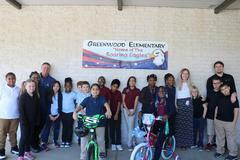 These two third graders recently won bicycles courtesy of the National Life Insurance Company. The National Life Group Prizes for Pages program rewards school children from elementary through high school with rewards for reading, at no cost to the school. MSEA President Cheryl Bost recently wrote Dr. Richard Warren Jr, She stated, "Thank you for all you do for your students in Somerset County each and every day! 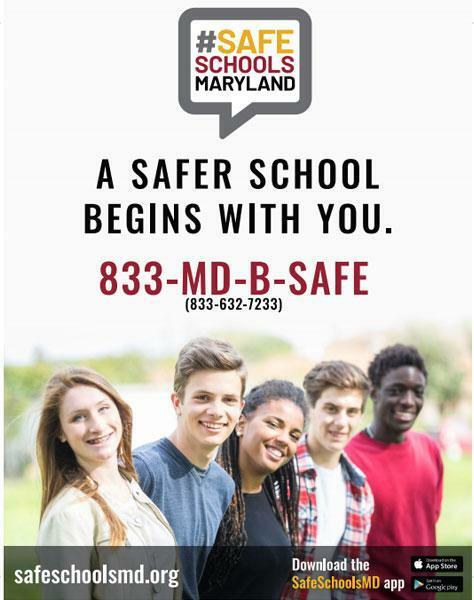 We believe you are an excellent candidate for an NEA Foundation in Teaching Excellence Award and would like to nominate you as our candidate from Maryland." Our outstanding 2019 Teachers of the Year with their great principals standing behind them. Deal Island Elementary School's 2019 Teacher of the Year, SCPS' Elementary Teacher of the Year and overall selection for the school system's Teacher of the Year Christina "Christy" N. South. 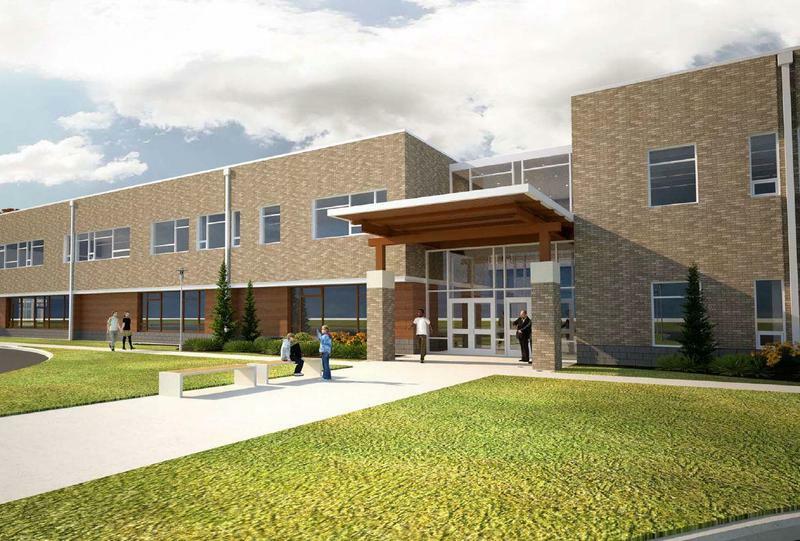 She is shown with (from left to right) Board Chairperson Penny Nicholson, Director of Schools Tracie Bartemy and Superintendent of Schools Dr. John B. Gaddis. Congratulations Christy and congratulations to all 2019 Teachers of the Year. Washington Academy and High School's 2019 Teacher of the Year and SCPS' Secondary Teacher of the Year Andranette "Nettie" Holden-Hall. J. M. Tawes Technology and Career Center's 2019 Teacher of the Year carpentry and masonry teacher Joe Webster. 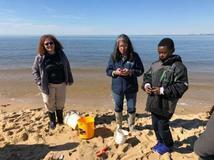 Crisfield Academy and High School's 2019 Teacher of the Year science teacher Angelisa Hosfield-Bowden. Woodson Elementary School's 2019 Teacher of the Year music teacher Korinne Jones. Princess Anne Elementary School's 2019 Teacher of the Year kindergarten teacher Courtney Dryden. Greenwood Elementary School's 2019 Teacher of the Year 2nd grade teacher Raleigh Nelson. Somerset Intermediate School's 2019 Teacher of the Year 7th grade mathematics teacher Melissa Lasinski. 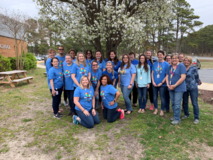 Staff at Woodson Elementary School dressed in blue for Autism Awareness on Friday, April 5, 2019. 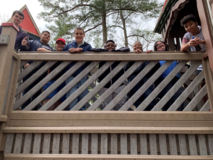 Mr. Fairman's class and Mr. Cartwright's class visited the Salisbury Zoo on Friday, April 5. A second grade student at Woodson Elementary, and his family participate in a STEM activity during the Royal Engagement Night on Wednesday, April 3. 2019 J. M. Tawes Teacher of the Year, Joe Webster. 2019 J.M. Tawes Career and Technology Center Teacher of the Year Joe Webster. Joe Webster teaching his class. 2019 Crisfield Academy & High School Teacher of the Year Angelisa M. Hosfield-Bowden. 2019 Deal Island Elementary School Teacher of the Year Christy South. 2019 Washington Academy and High School Teacher of the Year Andranette Holden-Hall. 2019 Somerset Intermediate Teacher of the Year Melissa Lasinski. 2019 Woodson Elementary School Teacher of the Year Korinne Jones. 2019 Princess Anne Elementary School Teacher of the Year Courtney Dryden. 2019 Greenwood Elementary School Teacher of the Year Raleigh Nelson. We have just received a Community Foundation Grant for $4,000 to support the Family Child Care Accreditation Cohort. For the first time, Worcester, Wicomico and Somerset County Judy Centers are working together to increase the quality of family child care in the tri-county area. Dr. Richard Warren Jr. was recently interviewed by a reported form Channel 47 about equitable funding for students. Dr. Richard Warren Jr. at the Southern Maryland Teacher of the Year Retreat. 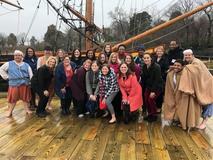 Southern Maryland Teacher of the Year Retreat. Crisfield Academy and High School Social Studies Teacher Brandon Austin was recently named Promising New Social Studies Teacher of the Year –Mr. Austin has demonstrated an exceptional commitment and made significant contributions to social studies instruction. On March 20, several Princess Anne Elementary School staff members participated in the McTeacher's Math Night at the Princess Anne McDonalds. Thank you Baxter Enterprises. They are shown in the lobby at the school. 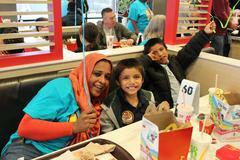 Princess Anne Elementary School held Math Night at the Princess Anne McDonalds recently. Thank you Baxter Enterprises. Washington Academy and High School Wicomico Women's Club Art Contest Winners. 2019 Paraprofessional of the Year include from left to right Bonnie Bishop (PAES), Lillian East (GES), Delia Young (WAHS). 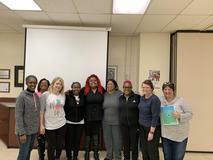 Not shown are paraprofessionals Tamera Bell (CAHS) and Cindy Swift (WES). 2019 Administrative Associates of the Year are Robin Henderson (PAES), Vickie Nelson (CAHS), Melissa Tilghman (Central Office) and Lynn Higgs (Central Office). Not shown is administrative associate Kathy Lawrence (WES). Bus Drivers/Contractors of the Year, Diane Daniels, Kevin Massey, Brian Laird and Richard Murray. Audrey Handy is not pictured. Superintendent Dr. John Gaddis facilitated a recent teacher recruitment and retention meeting. From the left is President of the County Commissioners Mr. Craig Mathies and Maryland Teacher of the Year Dr. Richard Warren Jr. at a recent minority recruitment and retention meeting attended by 40 staff members. 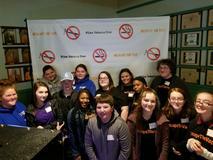 Students in the SADD and LEO Clubs at Crisfield High School participated in a Tri -County Escape the Vape workshop. This Princess Anne Elementary School first grader was the winner of the Maryland Council on Economic Education MCEE poster contest. She was one of 16 winners statewide. She will be honored at Towson University on May 15. 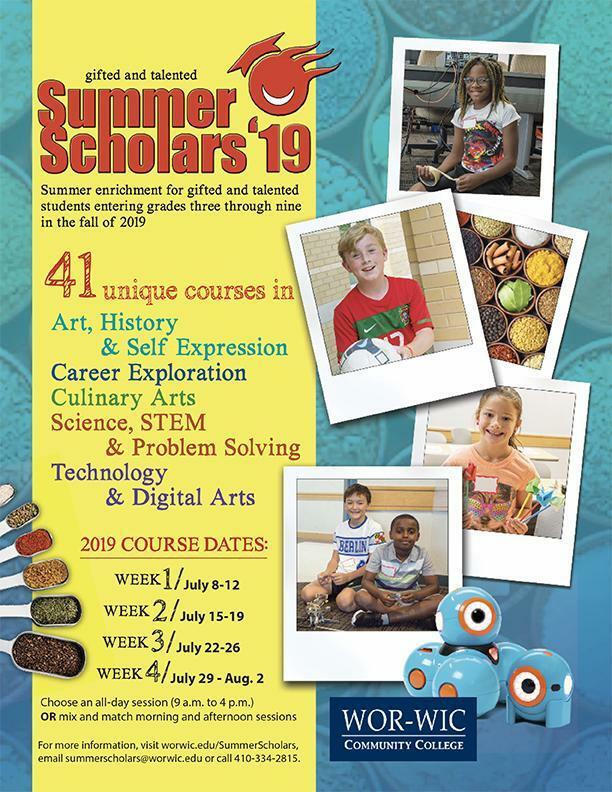 Supervisor of Instructional Technology and Social Studies Jill Holland is part of the 2019 teacher recruitment effort. 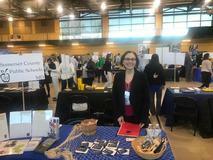 She is shown at the Millersville Teacher Recruitment Fair near Lancaster, PA. 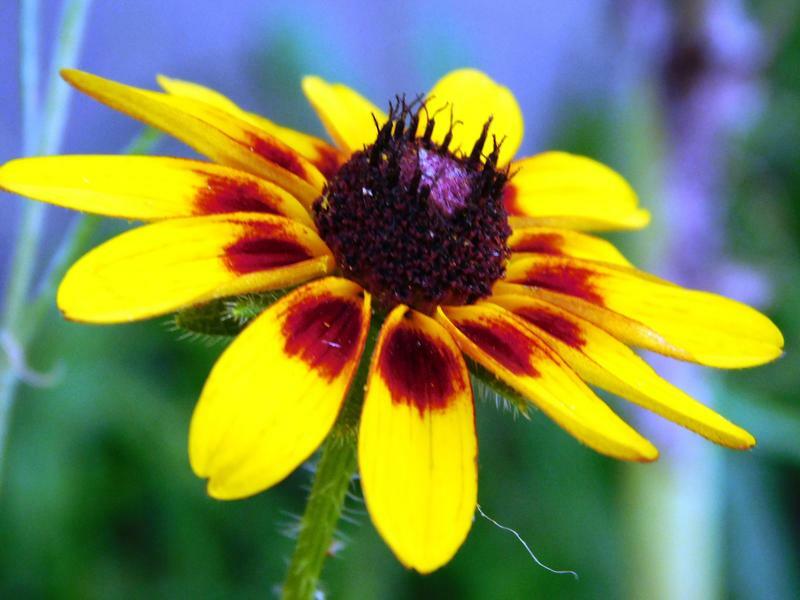 This photographic work was done by a Crisfield Academy and High School student. This student is a member of the Marion Volunteer Fire Department. 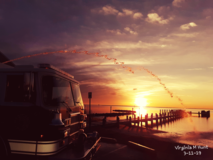 Wicomico Woman's Club Youth Art Contest Winner- A Washington Academy & High School 8th grader won 2nd place for the 8th grade portion of the contest for "Pastel Sunset." 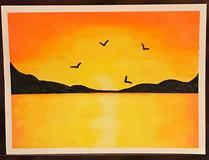 Wicomico Woman's Club Youth Art Contest Winner- A Washington Academy & High School 10th grade student won 3rd place for the Mixed Art Media portion. Assistant Principals Terra Taylor (Woodson Elementary School) and Jeff Hale (Crisfield Academy & High School) are in College Park today recruiting teachers at the University of Maryland. This is a busy time of the year as our recruitment teams try to help the school system sign new teachers. Deal Island Elementary School's 2019 Ben Carson Scholar appeared on DelmarvaLife on Monday, March 11. On Friday, March 8th, students and staff at Woodson Elementary School dressed up to celebrate Dr. Seuss' birthday. HVAC Skills/USA champions will compete on the state level in Owens Mills on Friday, April 12 and Saturday, April 13. 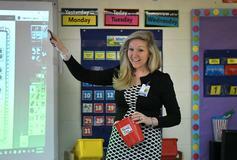 March 8- Ms. Kristen Horner's Pre-kindergarten class. 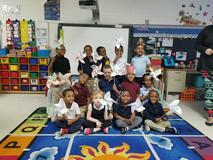 (Ms. Bonnie Bishop, paraprofessional) made pinwheels during their lesson about the wind. These four Deal Island Elementary School students were winners in the 2019 Eastern Shore Literacy Association Young Authors' Contest. Somerset Intermediate School Students at the National History Day Competition on March 2 at Salisbury University. To the left is their teacher Randi Merritt. A Crisfield Academy and High School junior won the state championship for the 55 meter high hurdles and high jump becoming the first indoor track state champion in Crisfield High School history. Washington High School Unified Sports Strength and Conditioning Team. They won their second gold medal in a row. They are state champions for 2018 and 2019. 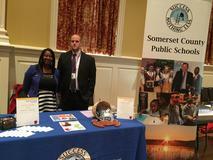 Somerset County Public Schools' Minority Achievement Committee. This Washington High School scholar-athlete scored her 1000th point in a game against Parkside Monday, February 10. She was recognized at the home game on Thursday, February 13. To her left is assistant coach Kylie Vogelsang and to her right is head coach Ronnie Knox. These 5th grade Deal Island Elementary School students recently won the 2019 American Legion’s Americanism Essay Contest. This year’s topic was “How Can We Address and Prevent Veteran Homelessness in our Communities?” The student to the right won first place and will compete in the District level later this spring. The only Washington High School athlete to play varsity basketball to score 2000 points needed three points and achieved the goal on the first play of the game against the Pocomoke Lady Warriors on Tuesday, January 30. Left to right are assistant coach Kylie Austin, volunteer coach Bill McInturff and head coach Ronnie Knox. Mrs. Sally Gaddis congratulated her husband Dr. John B. Gaddis just after he was named Maryland's Superintendent of the Year at the MNS Conference in Ocean City Thursday evening, October 25. Family members were on hand to celebrate Maryland's newly named Superintendent of the Year. Dr. John Gaddis is Somerset County's first Maryland's Superintendent of the Year. Dr. Warren accepts the honor of being named the 2018-2019 Maryland Teacher of the Year. He will compete nationally. 2018-2019 Maryland Teacher of the Year.